Here’s why I get out of bed early for HubSpot… and how you can get customers to jump out of bed for you. I’m not a morning person. 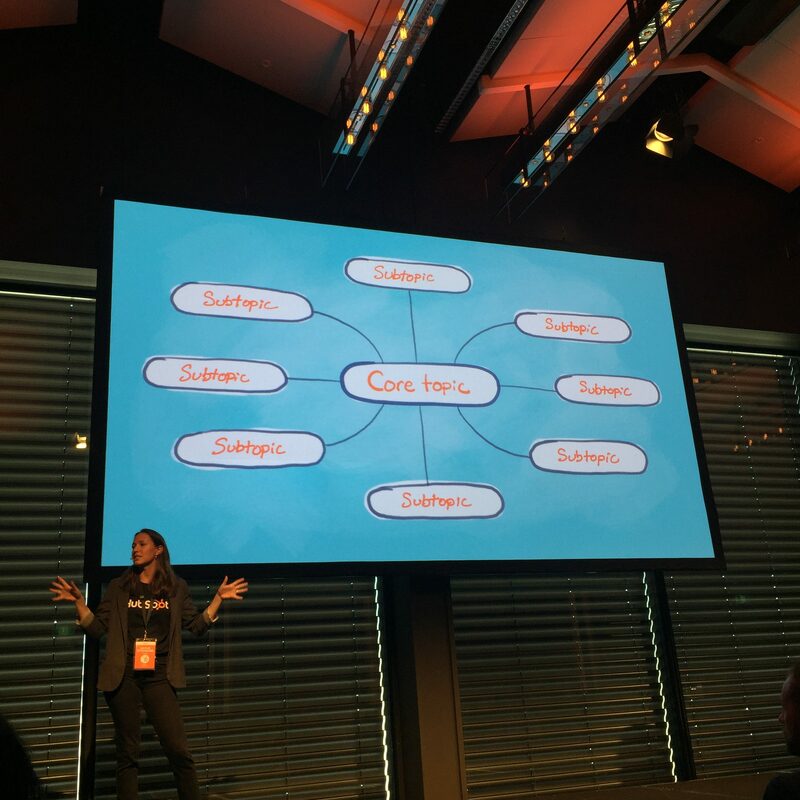 But I made an exception for Grow with HubSpot 2017 which kicked off at 7:30am at Sydney’s Hyatt Regency. 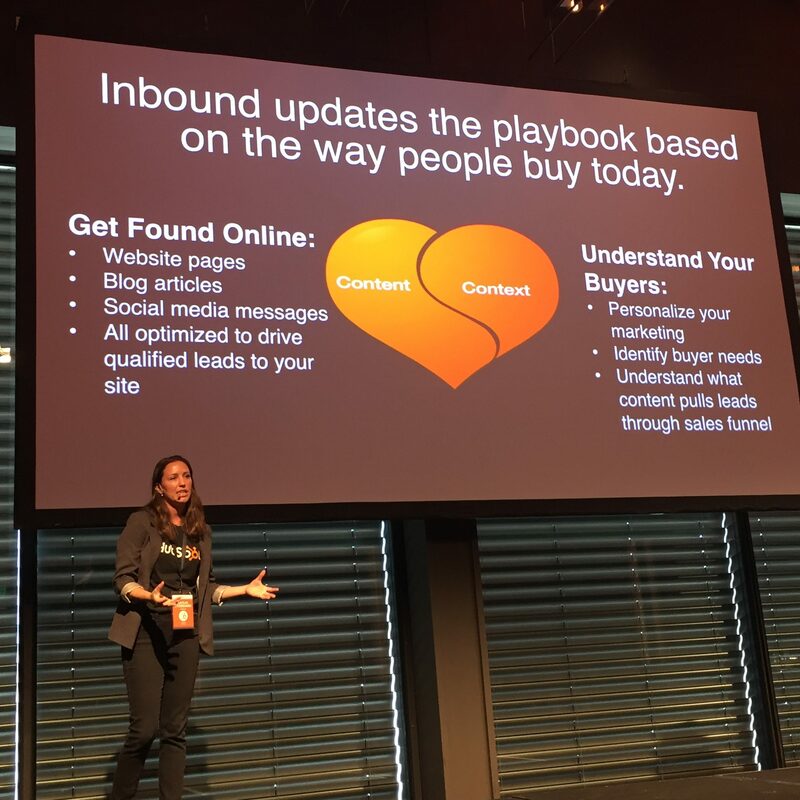 Here’s why I got out of bed before 6am for Hubspot – inbound marketing. Hubspot is a platform for businesses that want to attract customers – rather than pushing or selling to them – using things like content, SEO and social media. And that’s exactly what they used to pull me out of bed earlier than normal on a wintry morning. It wasn’t just a conference about inbound marketing, it was inbound marketing in action. They offered a free conference at a fabulous venue with high-profile speakers, and even free food. My only (tiny) hesitation was whether it would be relevant for small business: Would I learn anything to help me develop my own copywriting business? Would it help me to help my small business clients? While there was plenty of talk about funnels and data crunching and other more sophisticated marketing techniques, tactics and tools, there was a lot to learn from a small business perspective. No digital marketing conference would be complete without the “content is king” line being thrown around a few times. Why is content king? Just take a look around you. People aren’t staring down into their smartphones like zombies without a cause. They’re consuming content: news, articles, social media, videos and more. If you want to reach your target market, this is likely to be a great spot to reach them. Content – whether it’s blog articles, social media posts or video – is still a great (and affordable) way for many small business people to reach potential customers. But there’s also a reason people now sign out of their social media accounts for a weekend of “digital detox” – it’s a noisy, noisy place online. So, don’t add to the noise. Be relevant, be helpful. Think about what content you’re putting out there and why. And if you’re in a particularly noisy industry or feel you don’t yet have anything useful to say, think about curating content via a channel such as social media – help people deal with the noise rather than adding to it. There were many guilty giggles from the audience as Matthew Barby, Global Head of Growth & SEO at HubSpot, described just how lazy we’ve become thanks to digital technology. The era of instantaneous access – think Netflix, Spotify and Uber – means we may not even bother moving out of our chair to walk to another room and find that credit card we need to complete an online transaction. Be curious and test new channels of communication. 3. SEO: a shift in thinking? HubSpotters Kaitlin Stoddard and Marilia Salvia-Teixeira led a break-out session on SEO, discussing how search engines and searchers are changing. 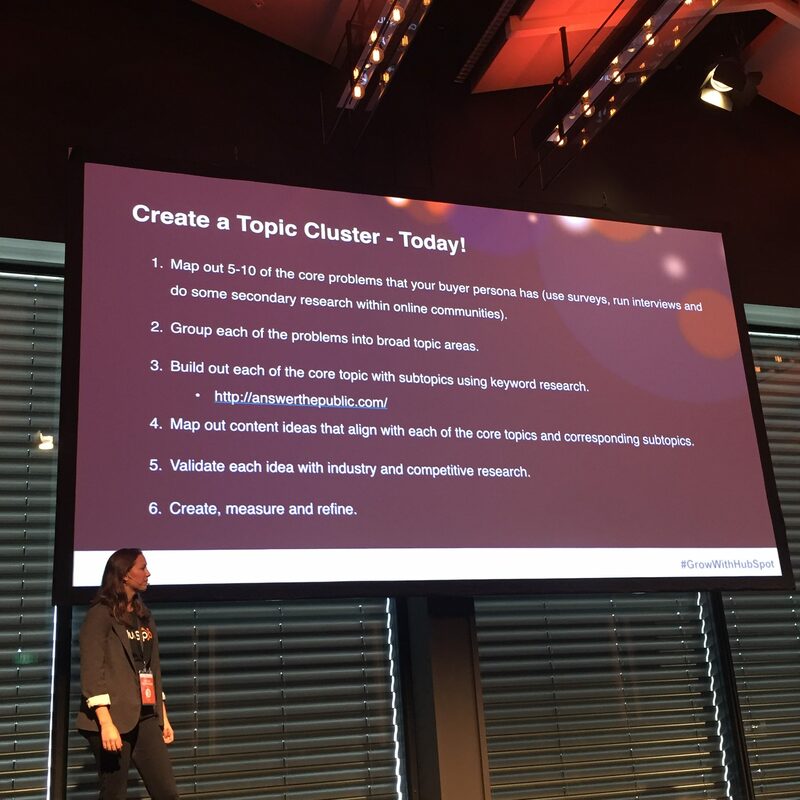 After running through the ideas that search engines are getting smarter and searchers more specific, the speakers championed the idea that we should now be focusing on topics rather than just keywords when optimising content for search engines. They indicated that Hubspot has adopted this strategy and increased traffic by 50%. It’s not a complete change but rather a subtle shift or change in emphasis. Instead of just looking at a website’s SEO with a page by page perspective, allocating keywords to each page, they encourage identifying a core topic for which you want to hold some authority and then building cluster content – blog posts – that link back to the pillar page and flesh out the topic. Towards the end of the day, Jeff Bullas and marketers from HubSpot, Canva and LinkedIn debated the future of marketing and covered topics from automation to storytelling, the rise and fall of marketing channels and artificial intelligence (AI). A few things that these high-profile marketers mentioned left me feeling optimistic as a small business owner. Andre Pinantoan, Head of Growth at Canva, predicts small business won’t be left behind as the machines take over. He says that like many technologies, AI is expected to be democratised in the next few years enabling small business to take advantage of freemium model AI software. Head of ANZ Marketing at LinkedIn, Ben Eatwell, focused on the key skills for marketers in the next few years, nominating soft skills such as communication skills and curiosity as important qualities for marketers. And while the future of marketing may be filled with technology, it’s technology that often aims to give customers a more personalised experience. HubSpot’s Elissa Hudson noted how larger businesses (including HubSpot) are experimenting with more personal channels such as Facebook messenger but “tech is holding business back” from delivering a more personal experience. It’s an interesting question: will tech ever be able to replicate the type of personal customer experience delivered by a person? Who knows? In the meantime, small business has a clear advantage in delivering the more personal experience consumers often crave. 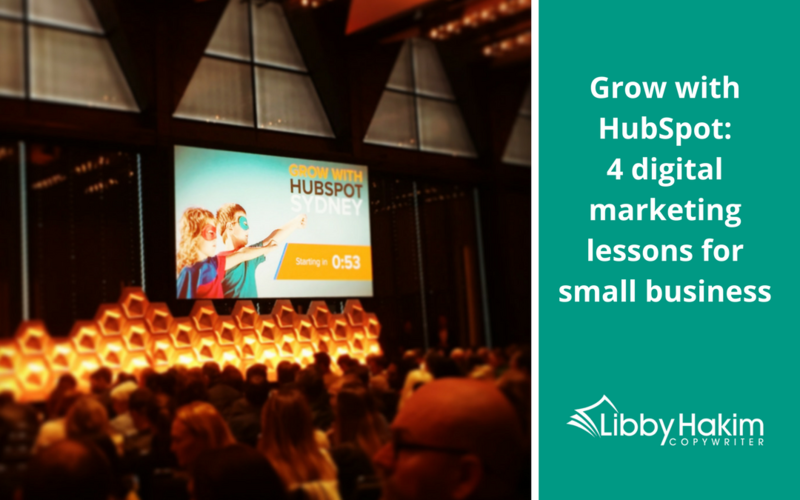 More than 1,000 people attended Grow with HubSpot 2017 in Sydney and not only learnt about inbound marketing but saw it in action throughout the day. I’ve a big believer in inbound marketing – it’s a more natural, thoughtful and fun way to generate interest in your product or service (and ultimately sales). And since attending Grow with HubSpot 2017 I’m more convinced than ever that inbound marketing works – any strategy that can get me out of bed before 6am on a winter morning is a very powerful one! Boost your LinkedIn profile with 7 simple copywriting techniques Website legal requirements: does your website tick ALL the boxes?  Business and writing tips delivered to your inbox. Not every day. Not every week. Just when I've got something useful to share.